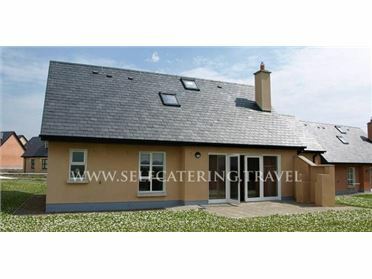 Holiday Cottage is a lovely, detached cottage sitting in a wonderful position, enjoying far-reaching sea views, in the village of Cross, County Clare. With three bedrooms including one ground floor double, one double with en-suite shower room plus one twin with en-suite shower room, this cottage can sleep six people. The cottage also includes a sunny kitchen with breakfast bar and dining area and a sitting room with an open fire as well as a second sitting room. Outside is odd road parking for two cars and a lawned garden with furniture. Holiday Cottage offers a fantastic base for friends and families looking to explore the beautiful Loop Head Pennisula, and is surrounded by breathtaking scenery and a wealth of nearby attractions. The quiet village of Cross is located along the breathtaking Loop Head Peninsula, a slender finger of land that extends into the Atlantic Ocean, embracing some of Ireland's supremely stunning coastlines. The village has a pub and a shop, and is recognised as one of only three communities on this stunning headland. Electric storage heating with open fire. Electric oven and hob, microwave, fridge, freezer, washer/dryer, dishwasher, TV with Saorview, DVD, selection of books, games and DVDs. Fuel, power and starter pack for fire inc. in rent. Bed linen and towels inc. in rent. Cot. Off road parking for 2 cars. Lawned garden with furniture and vegetable garden. One well-behaved dog welcome. Sorry, no smoking. Shop and pub 2 mins walk. Beach 1 mile. Note: Vegetable garden provides organic produce for guests, free of charge when in season..